Planeta Hotel is situated on Pobediteley avenue in the centre of Minsk, where the cultural and business life of the city is the most concentrated. Despite the central location of the hotel the building is located apart from the noise of the main streets. 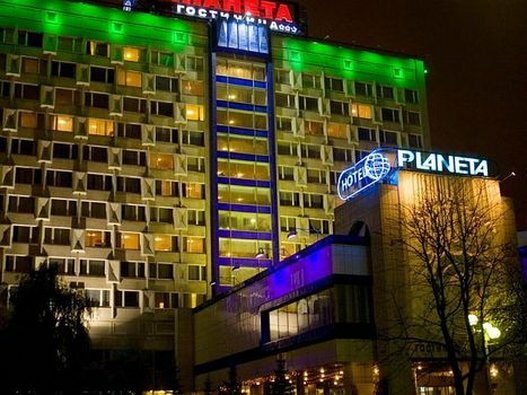 Through windows of the hotel one can see the capital's remarkable sights, have a sweeping look from the height at old Minsk. The welcoming and professional hotel staff is eager to help with choosing appropriate accommodation options, arrange porter service or deliver the luggage to cloakroom, arrange a taxi, advise on available additional services and entertainment available in town, and will make sure that guests experience no inconvenience during their stay. The hotel accommodates rooms of various categories so everyone could find an optimal solution for staying. Depending on the category special features such as a mini-bar, a safe, air conditioning, TV, telephone and fax are included. Additional services and facilities for visitors are the following - currency exchange, ATM, laundry, cloak-room, beauty salon. For business guests hotel offers a wide range of features - meeting halls, a business center and special equipment (video facilities, microphones, projectors). In all areas of the hotel, rooms included, Wi-Fi Internet is available free for all visitors. Driving guests will be able to safely park at the hotel's parking lot.